These are indeed dark, sad days, not only to you and to us, but to thousands of others who are mourning the loss of husbands, sons and brothers, or awaiting in agonizing suspense the result of these impending battles. 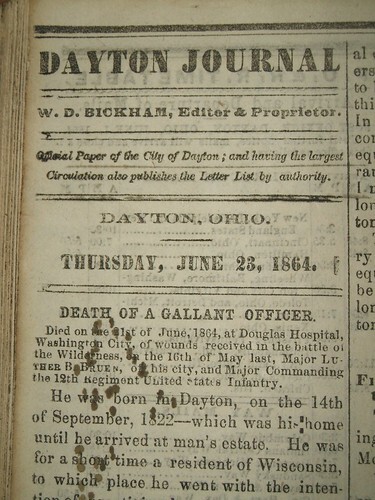 Luther Barnett Bruen was a 38-year-old Daytonlawyer when he enlisted in May of 1861. He was commissioned a Major with the 12th U.S. Infantry. He was born in 1822, and in 1853, he had married Augusta Forrer, daughter of Samuel and Sarah Forrer and older sister of Howard Forrer. Luther and Augusta had three children already, and before the war ended, they would have a fourth. Luther enlisted with the regular army, accepting a commission as a Major with the 12th United States Infantry. He was first stationed at Fort Hamilton, near the harbor in New York City, where he was in charge of recruiting for his regiment. He remained at Fort Hamilton through most of 1862 and 1863. However, as far as I can tell from the records available, Luther did not go to the battle front until January 1864. His wife Augusta did return to Dayton fromNew York sometime in 1863, probably because she was pregnant with the couple’s fourth child, not necessarily because Luther had actually been ordered away. 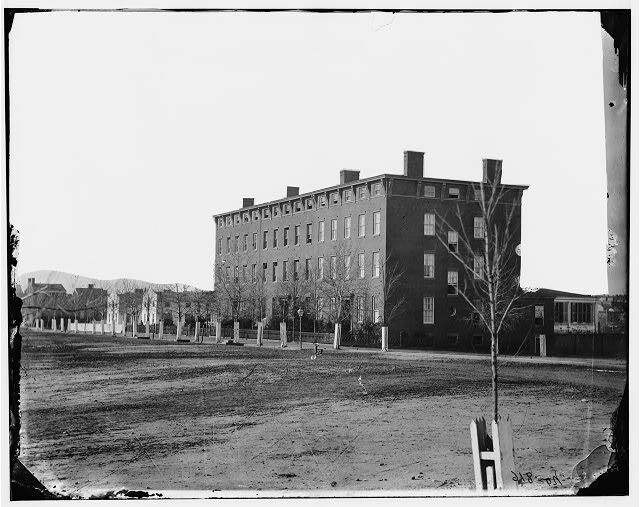 Luther made a short visit home to Daytonto see his family, including his new baby daughter, whom he had never met, between December 1863 and February 1864. Luther…came, but his visit was so short he had hardly time to get acquainted with Baby. Still, though short, his visit was a great comfort to his family and to us all. In January 1864, Luther took command of the First Brigade, Second Division, V Corps (under the direct command of General G. K. Warren), in the Army of the Potomac. 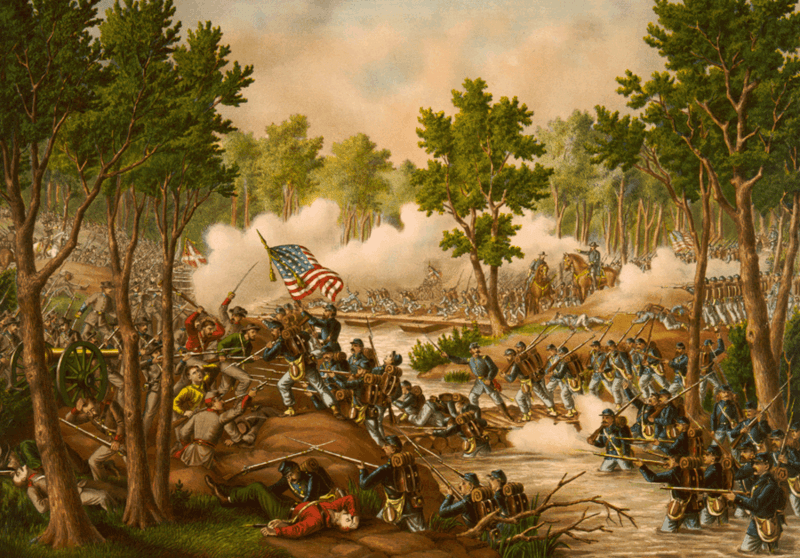 The V Corps, including Luther Bruen, participated in the Battles of the Wilderness and Spotsylvania Courthouse inVirginia, in May 1864. On May 13, 1864—which, by the way, was a Friday—Luther was wounded during a battle near Laurel Hill, Virginia, receiving a shell fragment in his knee. He was transferred to Douglas Hospital in Washington, DC, where after 10 days, his leg was amputated above the knee. I passed to the others who had neither sister, wife, nor brother, to cheer them. I found a Major of theU.S.A., from Dayton,Ohio, shot through the leg, but cheery and gay. Gazing at the flowers in my bonnet—which are blue Pansies—he said, “I found some of the most beautiful wild violets on the battlefield I ever saw, and pressed some of them. You love flowers and beautiful things I know, and I will give you one of my violets.” This broke the ice between us and a most entertaining chat ensued, resulting in a promise to call again next day. Have just returned from Douglas Hospital, after an absence of three days. The chatty Major had his leg amputated yesterday—is very much changed in the last three days—looks feverish and so weary. I fanned him awhile, saying all the comforting things I could think of.—He has telegraphed his wife to come. I hope she will come quickly. Indeed, Augusta Bruen did go quickly toWashington. I am very glad to hear there is a fair prospect of the Major’s recovery, and am much obliged to thee for sending me Augusta’s letters. I received one from her a few days ago…from…which I learn that his health is still improving. Even if Luther might have seemed somewhat improved, nevertheless, the stress and worry was clearly wearing on the Forrer family. In fact, son-in-law Luther was not getting better at the hospital in DC, and God only knew where their son Howard even was, traipsing around the South with General Sherman. As if Samuel and Sarah Forrer did not have enough to worry about—did I mention they were also building a new house, in the midst of worrying about their family members on the war front?—they started to worry about each other. We have had nothing from Howard and I almost fear to hear… I have written as cheerfully to him, as possible, and hope I shall not depress and unnerve him worse when he needs all the energy possible, Dear dear child! If we can only have him with us again! Nonetheless, the Corwins went to Washington, and so too did Augusta’s brother-in-law Jeremiah H. Peirce. These, along with Luther’s wife Augusta, were at his bedside when he breathed his last on June 21, 1864, a little more than 5 weeks after he was first injured. He was 41 years old. On June 23, the group returned to Dayton with Luther’s body. He was buried June 28 in Woodland Cemetery in Dayton. The pressed wild violet, which the dying soldier gave our fair correspondent, will be typical of him: plucked just in its brightest bloom, in the early summer of hope, and joy, its form of beauty shall remain a keepsake for surviving friends, reminding them that from hero graves goes up to heaven the rich odor of duty done to God. Major Bruen was a very affectionate husband and father, and a devoted friend. He was in easy circumstances, and he became a soldier, and gave up the pleasures of a home from a sense of duty. Not long since, in conversation with a friend, he said that “he had gone into the army in obedience to his sense of duty—not from necessity, nor because he liked the trade of blood; and whatever should be his fate, he would try to meet it without a murmur. He was an honest and just man, a brave soldier and a true patriot. We shall long remember our true hearted friend with sorrow and with pride. Augusta and her children had stayed with her parents Samuel and Sarah Forrer for much of the time that Luther was in the army, and they stayed for many years after Luther died. Augusta eventually moved to Bristol, Connecticut, where her son Frank lived. Augusta Bruen survived her husband Luther by 43 years, about four times longer than the number of years they were actually married. Augusta said to me once – that she hoped her husband would wait for her but that she sometimes feared he would progress so far ahead of her that she should never reach him. 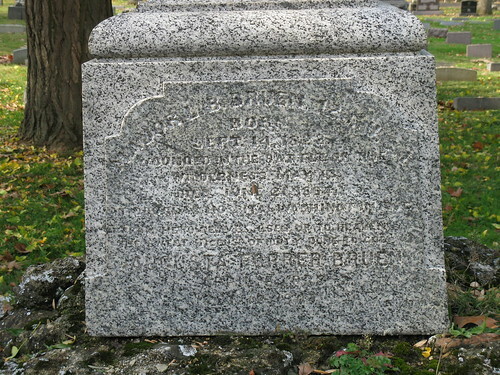 Augusta Bruen died on October 18, 1907, at her home in Bristol, Connecticut, at the age of 74. 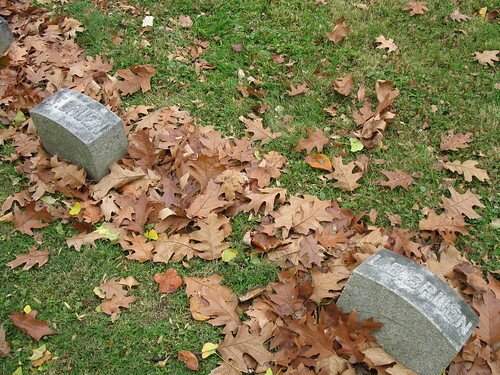 Augusta was buried beside her husband Luther in Woodland Cemetery on October 21. I like to think that Luther was waiting to greet her at the Pearly Gates—maybe wearing his army uniform. Mary Affleck to Sarah Forrer, 5 Jun 1864, Forrer-Peirce-Wood Collection (hereafter cited as FPW), 35:3, Dayton Metro Library, Dayton, Ohio. Forrer Genealogical Data, FPW, 7:12; Frank Bruen, Christian Forrer, the Clockmaker, and his Descendants (Rutland, VT: Tuttle, 1939), 129, 132; 1860 U.S. Federal Census, Ancestry Library Edition; American Civil War Soldiers (database), Ancestry Library Edition. U.S. Civil War Soldiers and Profiles (database), Ancestry Library Edition; American Civil War Soldiers (database), Ancestry Library Edition; Luther Bruen to Samuel Forrer, 27 Aug. 1862, FPW, 33:10; Sarah Forrer to her daughters Mary Forrer and Augusta Bruen, [several letters in 1862], FPW, 4:5; “Major Luther B. Bruen: Death of a Gallant Officer” (obituary), Dayton Journal, 23 June 1864, reprinted in Bruen, Christian Forrer, 132-133. Sarah Forrer to Mary Forrer, [24?] Aug. 1862, FPW, 4:5. Sarah Forrer’s diary, 29 Dec. 1863 and 14 Feb. 1864, quoted in Frances I. Parrott, “Sons and Mothers,” [undated], FPW, 32:4. U.S. Civil War Soldiers and Profiles (database), Ancestry Library Edition. Miss Ransom to unknown, [May/June 1864], reprinted by a Cleveland newspaper as “The Dying Major and the Wild Violet,” [June 1864? ], with the article being reprinted in Bruen, Christian Forrer, 130-132; “Major Luther B. Bruen: Death of a Gallant Officer” (obituary). Mary Affleck to Sarah Forrer, 5 Jun 1864, FPW, 35:3. Mary Affleck to Sarah Forrer, 19 Jun 1864, FPW, 35:3. 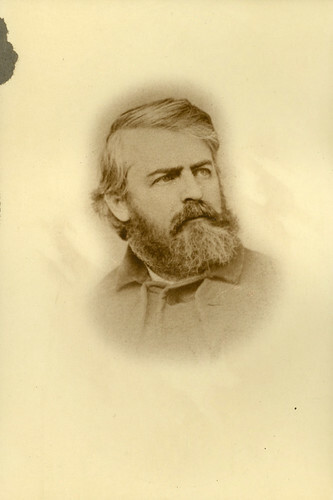 Samuel Forrer to Sarah Forrer, 19 June 1864, FPW, 1:8. Miss Ransom to unknown, “The Dying Major and the Wild Violet”; “Major Luther B. Bruen: Death of a Gallant Officer” (obituary); U.S. Civil War Soldiers and Profiles (database), Ancestry Library Edition. 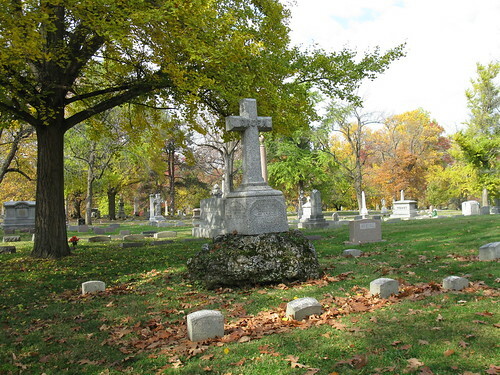 Woodland Cemetery & Arboretum Interment Database, accessed 20 Dec. 2011, http://www.woodlandcemetery.org. Luther is buried in Section 102, Lot 1348. “Major Luther B. Bruen: Death of a Gallant Officer” (obituary). 1870 U.S. Federal Census, Ancestry Library Edition; 1880 U.S. Federal Census, Ancestry Library Edition; [Various letters], FPW. Augusta Bruen to Sarah Forrer, 14 Sept. 1864, FPW, 33:1. Laura Vail Morgan to Sarah H. Peirce, 7 Nov. 1907, FPW, 17:10. 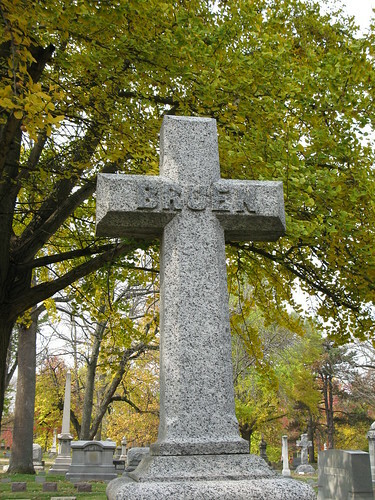 Bruen, Christian Forrer, 129-130; “Sister of Mrs. J. H. Peirce Dies in Bristol” (obituary), Dayton Herald, 19 Oct. 1907, reprinted in Bruen, Christian Forrer, 130; Woodland Cemetery & Arboretum Interment Database, accessed 20 Dec. 2011, http://www.woodlandcemetery.org. This entry was posted in History and tagged 12th united states infantry, a tale of two howards, battle of spotsylvania courthouse, battle of the wilderness, bruen family, civil war, douglas hospital, forrer family, forrer-peirce-wood, found it in the archives, history, u.s. army, washington dc. Bookmark the permalink.